You can easily view and copy from a previous set of reports. Above the pupil list just select a previous set of reports from the drop down menu. You can now use the regular controls to select pupils, read reports and copy text. Click the 'View' toolbar icon, select 'Legacy past reports'. 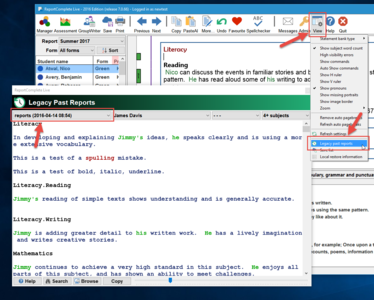 The system will search your computer for sets of legacy reports and a window will appear. Use the dropdown menu to select the set of reports you want to view or copy from. This page was last modified on 14 April 2016, at 07:11.